Geek Grotto - Get Your Geek On! : Danganronpa 2: Goodbye Despair Has It's Release Date Set! Danganronpa 2: Goodbye Despair Has It's Release Date Set! And that date is September 2nd in the US and September 5th in Europe, both in retail and PSN! 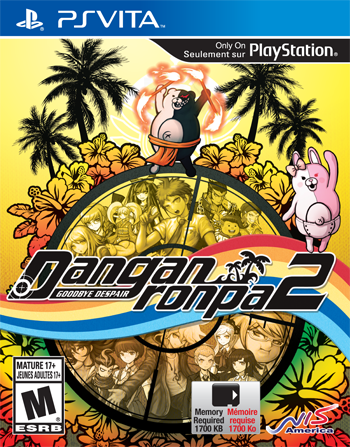 Santa Ana, Calif. (June 4, 2014) – NIS America is excited to announce that Danganronpa™ 2: Goodbye Despair , the sequel to the highly popular mystery adventure game Danganronpa: Trigger Happy Havoc, will be making its way to the PlayStation®Vita in North America on September 2 and to Europe on September 5. The game will be available in both retail and digital form. As in the first game, players will take on the role of a high school student as they are thrust into a life-or-death situation, and must use their wits and teamwork to survive. Each student was chosen for a special ability they possess, making them the “ultimate” example of something. Characters in this title are also designed by Rui Komatsuzaki for a unique and darker take on the anime style. motive, and means behind each killer case! happened. But watch out! If a student is unconvinced, they'll challenge you to a one-on-one Rebuttal Showdown and force you to defend your argument!